NOTE: This is an adaptation of an earlier post that was from my wordier days 🙂 Still just as relevant, but more bite-sized. It’s Sunday morning. The trendy pallet wall backdrop is all set on a stage that is littered by strategically placed instruments and a podium as church-goers chatter and move about. Observe the scene long enough, and a particular subset might begin to capture your attention. It’s a group that doesn’t seem to fit any other category. They aren’t found among the “keenagers” who gracefully make their way to the back rows of the church. They aren’t among the youngsters being ushered to Sunday school or youth group. They aren’t found among the parents of said youngsters or the starry-eyed young marrieds without kids. They are the 20 plus somethings that meander through the rest, interacting, serving, and existing. Not sure where you fit in that list, but you can count me as a seasoned member of the ragtags. In my experience, I have been fortunate to find friendship and belonging within the church among all the other groups, but it hasn’t been without its challenges. In this piece, I hope to answer the following question: How can churches allow singles to flourish as God has called them? It is a question that is not easily answered, as singles range on the marriage scale from “Woe is me!” all the way to “Dodging that bullet!” Additionally, most singles will probably at one point get married, so how do we balance our discussions with that possibility? I will offer 3 do’s and don’ts of interacting with single believers, emphasizing how to best encourage them in their walk with Christ without assuming God’s plan regarding matrimony. In the classic movie My Big Fat Greek Wedding, the main character’s father mourns her singleness in her early 30’s. In a memorable line, he says pathetically, “Get married, make babies, you’re starting to look so OLD!” Traces of this woeful mindset might be found in certain attitudes or even prayer requests among church-goers in regards to their single friends. Let me say something that needs to be said. Single people do not need other people to be burdened by their singleness! While it’s true that Galatians 6:2 speaks of “bearing one another’s burdens”, the bearing typically occurring in this kind of scenario hurts rather than actually helps the situation. They are in essence, reaching for the wrong luggage at the baggage claim. While the intention may be out of a desire to help, this will only make matters worse. I will offer a better way to bear this particular burden. The issue in this scenario is a misunderstanding of singleness itself. Singleness is not the enemy. If we treat singleness like the villain in someone’s story, then we paint the inaccurate picture that marriage is the answer to all his or her problems. Unfortunately, whether your single friend ends up married or remains single for a while longer, you have done nothing to help fix their problem and quite possibly have been part of what is holding them back from living as God intends them to. A better method to counsel is by offering the Gospel itself. Us singles need to be reminded of who we are and what we have in Christ. We need to be served a gracious dose of truth in love, that even if marriage came our way, it would not satisfy our deepest longings. If any burdens are carried on behalf of a single believer, it should be these deeper encumbrances and the need to learn to value Christ above anything this world has to offer. Do not make the mistake of picking up the wrong luggage! It is said that to tell a quality sushi restaurant from a subpar one, you need to find out if they are open on Sundays. Apparently, fish markets are typically closed on that particular day of the week, so in order for a sushi restaurant to serve their delicacies on Sundays, they must have a willingness to serve day-old products, thereby revealing a lack of culinary integrity. I am not sure how much truth is in this bit of hearsay and it has not really changed my sushi-eating habits, but I think the concept offers a valuable tip to church members. A quality church that allows singles to flourish should not sell fish on Sunday. I think this goes without saying, but the focus during church gatherings should not be pairing off, no matter how many fish are on hand. Ideally, the church atmosphere is the place one hopes to find a future spouse if there is one to be found, but when that becomes the goal of singles or those they interact with, there is potential for unintended implications. First of all, when singles are seen as projects to “fix”, the subtle message underlying the matchmaking attempts is that they are somehow incomplete or missing out. Christian matchmaking is not wrong in and of itself, and can be a welcome gesture for many singles, but there is a need to tread these waters more lightly. It is important to invest time into getting to know singles on a deeper level. Invite them into your life. Then, humbly breach the topic and find out if that is even something they desire. Additionally, if you plan on mentioning any kind of potential set up, make sure you intend on carrying it out. Statements about perfect matches with your husband’s friend’s cousin’s coach are not helpful to share if you do not really intend on seeing it through. The reality is that marriage and singleness are two paths that God uses for His purposes, and in 1 Corinthians 7, Paul implies that singleness is potentially better for the Kingdom because of its “undivided” nature. The nicest, most sincere complement I have ever received in regards to my singleness came from an older friend. She said that she had been observing me in conversation, and her initial thoughts were of what man I could end up with in our circle of acquaintances. “But then,” she exclaimed, “I decided that I really like you as a single person!” We work in ministry together, and I think she realized all the ministry opportunities I am able to pursue because I do not have the responsibilities associated with being someone’s wife. In conclusion, singles are in need of all kinds of encouragement from their fellow brothers and sisters. Unfortunately, I am afraid many of them are not provided with the correct kind of encouragement. Pointing them towards a local singles group or telling them that God’s best will come if they are patient does not get to the root of the issue or even represent the truths of Scripture accurately. 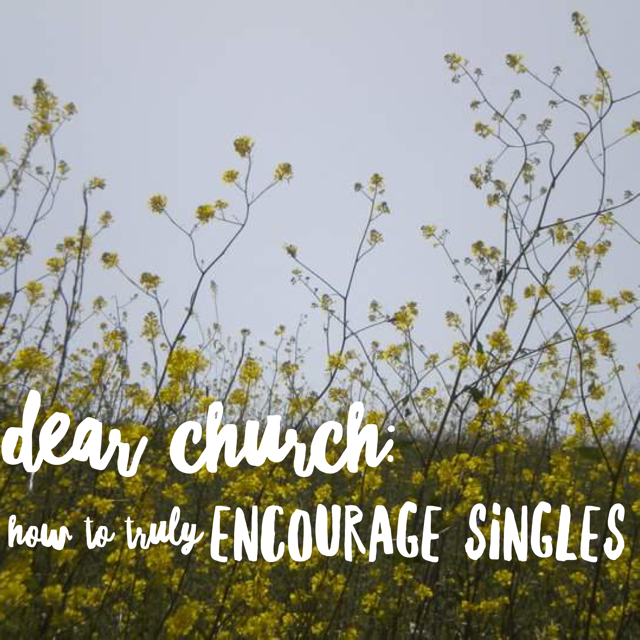 You want to be an encouragement to the single person in your Church? Begin by rewiring how you view earthly marriage, if need be, aligning your stance with God’s timeless truths. I fear that many of today’s Christian marriages have bought into the lies of our culture, so they are unable to be an encouragement to singles because their actions speak louder than words. If your happiness and fulfillment is rooted in your marriages and families instead of Christ, the singles in your sphere will pick up on that message. Seek God’s help in adjusting your spiritual priorities and then invite single brothers and sisters into your life. Be family to them. Show them how singleness does not have to be equated with loneliness, bitterness, monotony, or a spot on the sidelines of real life. Thanks for this post Rachelle. I agree with you totally. This past week I was talking to a friend about how much pressure there is on a single person to get married. I can’t tell you the amount of times i have been almost pushed into compromising what i believe so i can get married. (Friends think I am being too picky so I should lower my standards and chose a girl!) Married people don’t seem to understand that singleness like marriage is a gift from God. The view the church has of singles has to change indeed. I am trusting God to get married but until the right person comes along i will pursue all that He has for me right now. Life doesn’t start when i get married, it starts now! It’s so encouraging to know there are people out there who are in the same boat as you and are experiencing God’s blessing, favor and peace where they are. I am encouraged! My hope is that the church begins to see singleness as God does. God bless you as you continue holding steadfastly to Him.